A brother and sister live happily with their parents, but one day while playing in the garden, the sister gets very sick and the parents have to take her to the hospital. On the way, the older brother comforts his sister by telling her a story in a fantasy world. In the story, a rabbit and a plant are friends. But one day some evil purple growths appear and make the plant sick, so it’s up to the rabbit to help her. 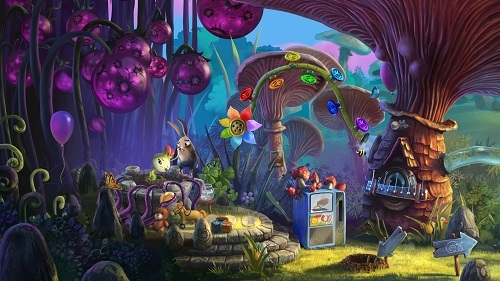 You play as the rabbit in this point and click adventure with hidden picture game elements. It’s available to download on most current game consoles and PC, but reviewed on PS4 here. In the game you view each area in a single screen, and can move a cursor around and click on objects. You’ll have to collect a certain number of objects to finish objectives, and that’s how this game is like those ‘find hidden objects’ challenges, like what you see in Highlights magazine. You’ll have to find sticks to use as rungs for a ladder so Rabbit can get out of his hole, or you’ll need to collect a number of balloons so you can carry the sick plant to the doctor. Sometimes you must click on items to use on other items to solve puzzles, or enter special screens to play a mini-game puzzle. The game’s story is told with little to no words at all, which is charming but it also makes the game rather vague. Most of the story I gleaned for this review was from the press release I got, not from the game itself. And with little to no instructions, I had a hard time figuring out what to do. I didn’t realize for a while that you had to hold down a button for a few seconds to enter certain areas, and I had to use a video guide just to get past the first room. Not because it was hard, but because I had no idea what to do, and the game doesn’t have any hint options I could find. I ended up just moving my cursor around and constantly mashing the button to see what I could click on, and that’s never good. It’s a shame because the premise of this game is very charming, and I would’ve loved to see it through had it not been for the bad gameplay decisions. My Brother Rabbit is rated E with an ESRB descriptor of Mild Fantasy Violence, but I didn’t really notice anything violent. Reading skill is helpful for some of the text, but most of the game is told with picture cues. But the lack of instructions and confusing gameplay may frustrate younger gamers. So did you not get through the whole game? I agree that a hint system would have been nice for when I got stuck looking for things, but I did like the way the game told you which items you would or wouldn’t find in some areas. I thought the art style and music were great too. Too bad the gameplay was kinda meh. I had a similar issue to you, where I got stuck early on cause there was a mechanic I could not for the life of me remember. It was when you had to attach the balloons to the plant girl’s stone seat thing you have a picture of in your review. I completely forgot the game wanted you to click and drag those to where you needed them.